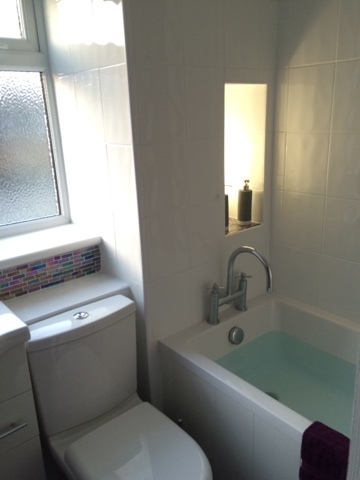 ...finally, 13 years after moving into our flat, we took the plunge and got the bathroom sorted out. when I say "sorted out" - the builder who did the work asked on arrival exactly what we wanted done and the answer was "everything" - so everything it was - quite literally floor to ceiling and even most of the walls. 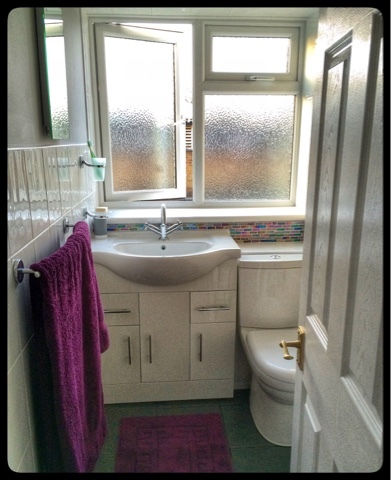 The issue we had with the bathroom from the start was that while it wasn't to our taste (far from it, in fact!) it was liveable-with. 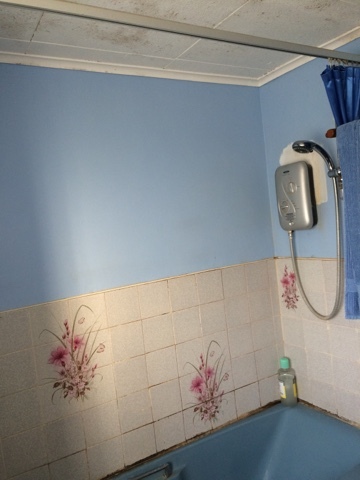 Once we'd got the previous occupants' years of neglect off the toilet, basin and bath that was. Even when the floor developed a hole, we learned to step over it and walk round it rather than be brave enough to actually commit to doing something about it. Over the years we've gradually put together ideas, thoughts and plans. That bathroom has been on our "to do" list for a VERY long while, and finally after a chat with a lovely friend a few months back (his take on it was "for goodness sake just DO IT - you'll talk about it forever! "), we took a deep breath and put the wheels in motion, getting the lovely Dave-The-Builder (he SO should have been called Bob!) to come and look, and quote, and then go ahead with the job. The biggest issues with the old room (discounting the blue suite, and the hole in the floor already mentioned), were the size - the room is pretty much tiny, although still astonishingly bigger than the bathroom in our old place which just ludicrously small - and the lack of storage. 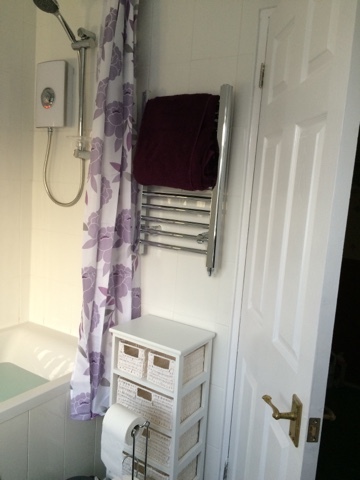 There was a vanity unit under the sink but it was essentially one big cupboard, so it made finding anything in there extremely difficult and when you pulled one thing out, there was a tendency for domino-effect to kick in as lots of other things that you didn't want, followed the first. We stuck a set of wooden IKEA drawers on the window sill for odds and ends but that blocked a lot of light and didn't help much on the storage front, either. It also had a tendency to get terribly damp - the 1980's polystyrene ceiling tiles didn't help with that and were truly impossible to keep clean. Everything gradually turned black with mildew and as fast as you cleaned it off, more took hold. 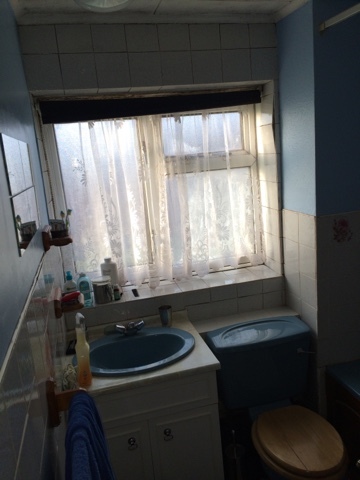 The double-glazed window had all its units blown - effectively meaning that it was no longer double-glazed, and the cistern on the loo was getting slower and slower to fill. ...for example - our gorgeous mosaic tiles. 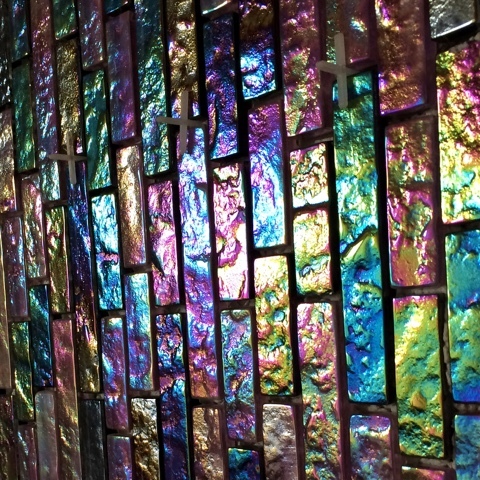 £135's worth of gorgeous mosaic tiles, to be exact - BUT they were exactly what we wanted, and they look stunning! (they look even better now they're grouted in, too!) Size limitations meant that we were struggling to fit in anything more than a 2-door vanity originally, but I knew for sure that a while ago I'd seen one that had the layout we wanted AND fitted the gap, so I dug around on the internet until I turned it up. This is the first serious job we've had done on the flat - and we've learned a lot from it - that a really good craftsman is worth his weight in gold, for example, Dave came to us as a recommendation and he's been brilliant. We ended up with the job going ahead quicker than we'd expected though - and that has caused some issues - basically I spent every spare second in the first week running round sourcing things, googling stuff and trying to get everything organised so it would be ready when needed. That when you live in a flat, having a garage which can be used for storage is a godsend - lord knows what we'd have done without that. That Topps Tiles online ordering system with "collection from store" means you have to wait longer for your tiles than had you opted for their free delivery to home. (Yes, that one caused a delay). That actually checking that that the Charcoal Grey rubbish bin you've ordered from the store IS Charcoal Grey, and not realising three hours after you get it home that, in fact, it's purple, saves a lot of time later. (No, it wasn't in a box, I was just so frazzled that I didn't even think about it. Credit to Dunelm Mill for superb customer service to sort that one out though!). Above all we've learned that attention to detail, and trusting your instincts, go a long way - the thing we're most pleased about is that we planned the room out from scratch ourselves, and it's all come together looking exactly as we hoped it would. I've posted before on the subject of Social Media, and it's good and bad sides. I'm still in two minds - I love the fact that it's so easy to share photos with an ever-wider audience on the likes of Twitter & Flickr, for example. That Facebook lets me stay in contact with people who otherwise, I'd have no likelihood of staying in touch with, and whilst I may not have much to do with them, I wouldn't want to totally lose touch. Facebook is also great for keeping in touch with people who fall into certain "compartments" in my life - airshow people in the winter, Great British Beer Festival friends who live at the other end of the country from one August to the next. Instagram is ace for being able to just see little snippets of people's lives - some I know personally, others I don't, but I choose to keep my "follows" on there to a small group as mostly this means that I can keep up with my feed and don't miss too much. In part as a result of that I've been surprised how fast my number of followers has built up to be honest - but it's truly lovely that so many people like what I post on there. Generally speaking whether online or in real life I do have an issue with people being two-faced. I'm always doubtful about trusting, for example, someone who is sweet as pie to someone's face, yet will happily slag them off to me, behind their back. Not nice, and it doesn't take much thinking to realise that person would almost certainly be doing the same in reverse! Happy to maintain an aquaintance of sorts with someone like that, but they are definitely never going to be someone who I will trust with my innermost secrets! Again, it sort of feels as though Social Media does facilitate this sort of behaviour too. A friend on FB has regularly had problem with someone on their friends list who is clearly acting as a go-between - passing information about him back to somebody who has been responsible for some fairly nasty online bullying of my friend in the past - and this too is having a huge impact on him as he simply doesn't know who to trust anymore. Considering that my friend has a history (which he freely and publicly acknowledges) of severe depression - that's a pretty low way to behave, and watching him crumble when yet another incident of this behaviour rears it's head is so sad. He's got the person who was the original problem blocked on every possible level, as has his partner, yet still the information leaks back, and he's simply run out of ideas to stop it. I regularly see cute little pictures being posted on Twitter, or lines in people's online biographies spouting legends about "being nice" - yet oddly enough so often, the sort of people who use that sort of thing are just the people who, when you watch their behaviour for a while, are about as far from "nice" as can be imagined! I often wonder if they replicate their online behaviour in real life - perhaps they are the people who will happily drive right down a closed motorway lane until they are practically on top of the incident it is closed for before confidently barging into a gap in the traffic that never really existed. Can they be found on trains sitting in someone else's reserved seat? Or maybe picking up every apple in the box in Tesco before selecting one perfect enough for them - carelessly throwing those they discard back into the heap to bruise them for everyone else? Are they those with a huge sense of entitlement and superiority complex who stalk around sneering at those they see as unworthy of or too lowly for their attention, and being rude to shop assistants just for fun? the one thing I am sure that all these people have in common is that actually, I suspect their lives aren't anywhere close to as happy as they try to pretend - nobody who is genuinely comfortable in their own skin, happy with their life and secure in their friendships has a need to act like this, do they, so perhaps these unpleasant characters we've all had the misfortune to run across, we should actually be feeling sorry for? I'll let you make your own mind up on that one, but you'll find me making every effort to avoid them, as I have been, thank you!